William Kelly's organ cuts through the opener "Long Gone" with a sharpness that is pleasantly reminiscent of the young Ozzy Osbourne. The quartet from Baltimore has three albums to its name. In the first two albums they seemed to be searching for their own identity. True to the motto "The way is the goal", they got out of the affair in a respectable way. The Doors were on their itinerary just like the early Floyd or Gdansk. With "Lowlands" they have now arrived. But where exactly? Maybe at the grave of Edgar Allan Poe, who died in her hometown. "Smile" has internalized the lunacy of the creepy bard. The track never really seems to get into gear, and at the end of the track you only notice that it was all about: not getting into gear. The longer the CD spins in the player, the tougher the mass of sound appears, and Kelly takes herself back more and more. On the first tracks of the album he made sure that he would stay present for three quarters of an hour. In the course of "Lowlands" his singing tends more and more to an amalgam of the timbres of Jim Morrison and Chris Cornell. In other words: Kelly is beyond all doubt, the man can quote without copying. And that goes for the whole band. The title track offers the most wonderful desert rock. It has an effect even though it doesn't come across as directly as the other numbers. On the other hand the nine pieces of the mid-twenties cannot be sheared over a comb, they offer enough playful free space despite their force and viscosity. 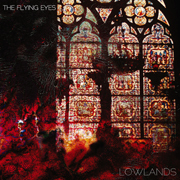 The Flying Eyes have secured the sovereignty to interpret their sound with "Lowlands". Guitarist/organist Adam Bufano, bassist McLean Hewitt and drummer Elias Schutzman act with a naturalness that doesn't need coolness poses.